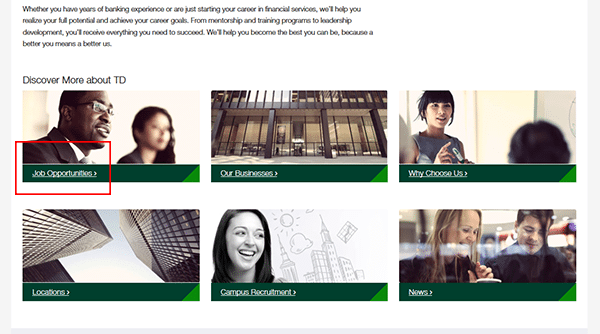 Go to the company’s main careers website to access the TD Bank job application. Retail, corporate, and call center job opportunities can be searched/applied for by visiting the careers website. To learn how to navigate the site, search the listing of current opportunities, and submit an application by reading the reference guide in the below section. About the Company: TD Bank is an American bank that has more than 1,000 locations throughout the Eastern United States. The company is headquartered out of Cherry Hill, New Jersey and is a subsidiary of Canadian multinational bank Toronto-Dominion. 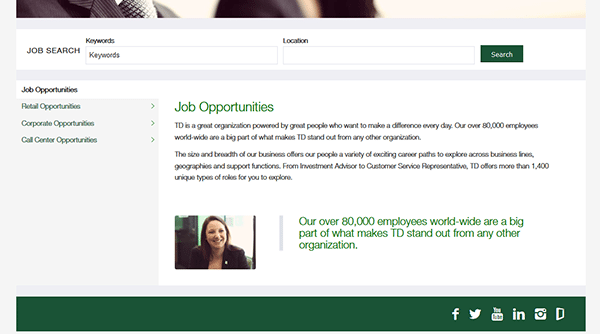 Step 1 – Click here to load the TD Bank careers website in a new browser window/tab. 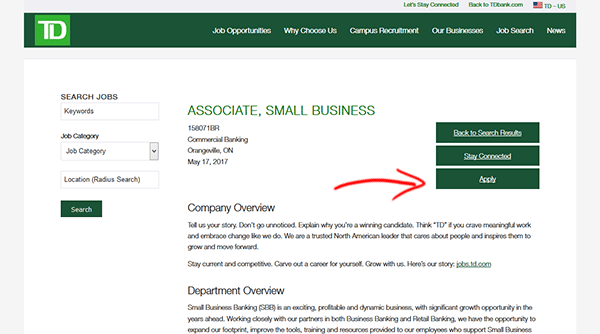 Step 2 – Scroll down the page and then press the “Job Opportunities” link. 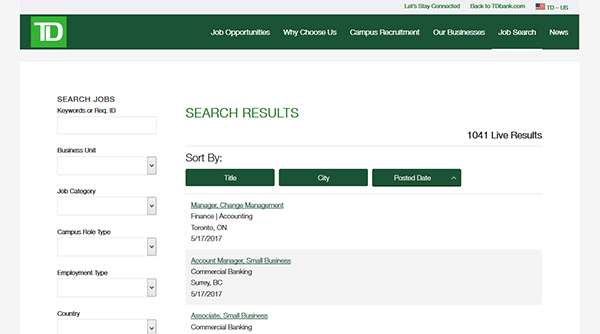 Step 3 – Enter a keyword or location into the job search form and then click the “Search” button to load the results. Step 4 – The results can be sorted by title, city, or posted date. 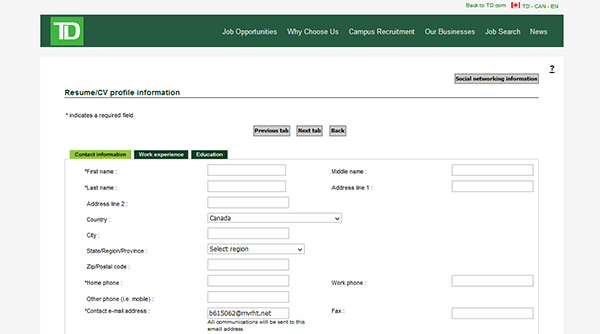 Step 5 – Press the link of the position that you’re interested in applying for. Step 7 – Click the button as shown in the below image. 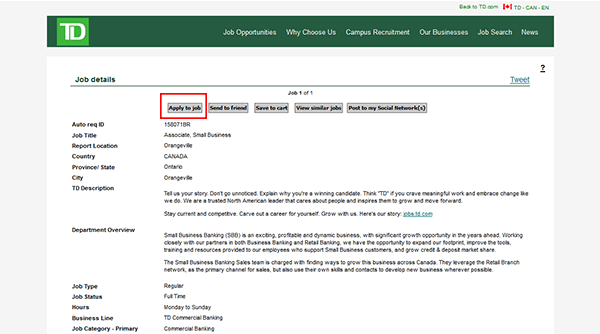 Step 8 – Review the job description again and then hit the button as outlined in the screenshot to move to the next step. 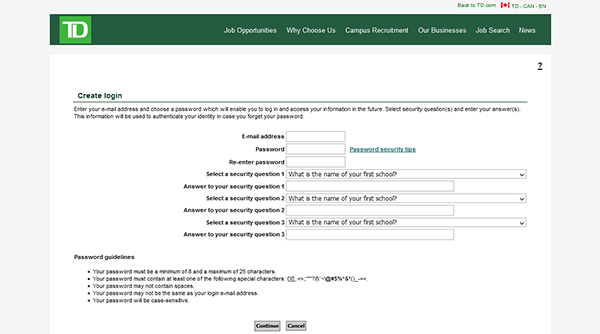 Step 9 – Press the “Click here to create a login” link to go to the registration form. Step 11 – Select your profile source (LinkedIn, Facebook, or build your own). Step 12 – Upload your resume/cv/cover letter. Click the “Continue” button to load the next section. Step 14 – Complete the “Work experience” and “Education” subsections.